Gastroesophageal reflux disease (GERD) and related symptoms are the most common gastric problems encountered frequently. Proton pump inhibitors (PPI) have shown the greatest efficacy in relieving GERD symptoms but severe cases of GERD can be refractory to PPIs and becomes difficult to treat with medications. Multiple etiologies are responsible for GERD, such as malfunction of the lower esophageal sphincter (LES), abnormalities in the esophagus, impaired stomach function (gastroparesis), motility abnormalities, hiatal hernia, asthma, diabetes, pregnancy, gastric surgery, genetic factors, and drugs that increase the risk for GERD (non steroidal anti-inflammatory drugs (NSAID), Bisphosphonate etc.). Depending on the etiology, treatment varies. In the presence of multiple etiologies, particularly hiatal hernia as illustrated in this case, patients can be considered as candidates for fundoplication. PPI combined with yoga can improve symptoms of severe GERD and delay or avoid the need of invasive procedures. A 62-year-old male presented with history of heart burn followed by dysphagia. An endoscopy showed a large hiatal hernia with a nonobstructing peptic stricture proximal to the gastroesophageal junction due to erosive esophagitis. The esophagogastroduodenoscopy (EGD) revealed presence of gastritis and duodenitis. 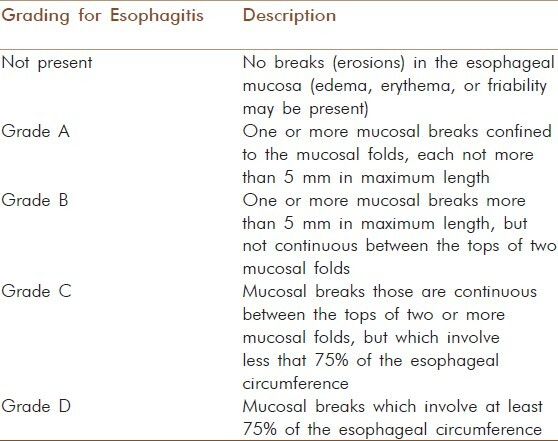 The patient had Grade D esophagitis according to Los Angeles (LA) classification of esophagitis [Table 1]. Initially the patient was started on a high-dose PPI. After 6 months of continuous treatment, repeat EGD showed LA Grade C esophagitis and persistence of a large hiatal hernia. We used Bravo (Bravo is a pH recording capsule used to measure acidity levels in the esophagus) study to accurately measure acid reflux and correlate it with clinical symptoms by keeping the patient off the PPI regimen temporarily. On a Bravo study, the patients DeMeester score on the 1 st day was 81.1 and on 2 nd day was 35.1, indicating severity of acid reflux. The patient was advised to continue treatment of high dose of PPI. In conjunction with PPI the patient began practicing Yoga daily for symptomatic alleviation of his GERD. Regular Yoga exercises included a Kapalbhati Pranayama and an Agnisar Kriya. After 6 months follow-up EGD revealed hiatal hernia and a nonobstructing peptic stricture just proximal to the gastroesophageal junction but his esophagitis grade improved to Grade A from initial Grade D esophagitis according to LA classification. To confirm these findings we did Bravo study and a repeat EGD after 5 weeks. The Bravo study showed a significant improvement in DeMeester scores; the day one score improved from 81.1 to 12 and the day two score improved from 35.1 to 17. These finding of EGD indicates that the patient had significant symptomatic improvement after 6 months of combined regimen of Yoga and PPI, which were refractory to high dose of PPI alone. His heart burn and dysphagia symptoms improved significantly in terms of both severity and frequency. He did not have nausea, diarrhea, constipation, postprandial fullness, bloating, and any other additional complaints. He had normal bowel movements. All of his blood tests were within normal limits. A follow-up Barium Swallow study was performed and showed normal oral transit time, pharyngeal transit time, reflex time and reflex strength. Biopsies of the stomach and duodenum demonstrated normal results except for chronic gastritis. This patient has shown the effect of regular practice of a Kapalbhati Pranayama and Agnisar Kriya on severe GERD. After adding regular Yoga exercises to the ongoing treatment of high dose PPI, he had dramatic clinical improvement evidenced by both the reduction of Bravo scores and improvement in esophagitis grading. Recently, the positive impact of yoga has been seen in studies on functional dyspepsia, irritable bowel syndrome, and inflammatory bowel disease. ,, Forms of yoga like, Kapalbhati and Agnisar kriya may be particularly useful in addressing GERD as they can increase diaphragmatic tone, thus decreasing reflux from the stomach to esophagus. Kapalbhati is one of 10 types of Pranayama (breathing control techniques), in which inspiration is passive and expiration is active through abdominal muscles, in order to clear the respiratory passage and strengthen the diaphragm. Agnisar Kriya is a method of contracting or "flapping" abdominal muscles in and out in order to promote improved digestion and gastrointestinal motility. The combined practices of Kapalbhati and Agnisar Kriya yoga have found to increased diaphragmatic tone and lead to reduced transient LES relaxation and increased LES tone. This synergistic effect can thereby decrease the reflux episodes experienced in GERD. Yoga may also be beneficial in alleviating GERD through impacting autonomic nervous system which limits the ability of the gastrointestinal tract to continue peristaltic contractions and prevents appropriate fluid and secretion shifts needed for digestion. During yoga practice, a relaxation response seems to be mediated through a reduction in epinephrine and response from end-organs. Physiological changes in this relaxation response include simultaneous lowering of heart rate, blood pressure, and respiratory rate, which are opposite manifestations of physiological stress. Increase in stress has shown to increase gastric-acid secretion, this is a direct risk factor for developing peptic ulcer. On the other hand, as yoga decreases the stress response of the digestive tract, this may been seen as a potential treatment option for GERD and peptic ulcer. Practicing yoga in conjunction with medications can be helpful in controlling and/or alleviation of symptoms related to digestive diseases. 1. Nwokediuko SC. Current trends in the management of gastroesophageal reflux disease: A review. ISRN Gastroenterol 2012;2012:391631. 2. Mitre MC, Katska DA. Pathophysiology of GERD: Lower esophageal sphincter defects. GERD IN THE 21ST CENTURY, SERIES-5; Practical Gastroenterology 2004;28:44-58. 3. McDonagh MS, Carson S, Thakurta S. Drug Class Review: Proton Pump Inhibitors: Final Report Update 5 [Internet]. Portland (OR): Oregon Health and Science University; 2009 May. 4. Panganamamula KV, Fisher RS, Parkman HP. Functional (nonulcer) dyspepsia. Curr Treat Options Gastroenterol 2002;5:153-60. 5. Zernicke KA, Campbell TS, Blustein PK, Fung TS, Johnson JA, Bacon SL, et al. Mindfulness-based stress reduction for the treatment of irritable bowel syndrome symptoms: A randomized wait-list controlled trial. Int J Behav Med 2012. 6. Cotton S, Humenay Roberts Y, Tsevat J, Britto MT, Succop P, McGrady ME, et al. Mind-body complementary alternative medicine use and quality of life in adolescents with inflammatory bowel disease. Inflamm Bowel Dis 2010;16:501-6. 7. Bhandari RB, Bhandari CB, Acharya B, Pandya P, Singh K, Katiyar VK, et al. Implications of corporate yoga: A review. Applied Biological Engineering - Principles and Practice. Chap. 28. 2012. p. 653-4. 8. Benson H. Hypnosis and the relaxation response. Gastroenterology 1989;96:1609-11. 9. Goldman MC. Gastric secretion during a medical interview. Psychosom Med 1963;25:351-6.